Roland has released a new software update for its M-5000 O.H.R.C.A. live mixing console. 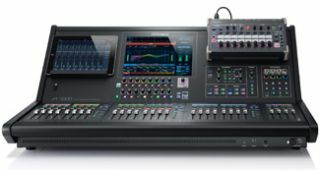 The new version 1.101 update equips the console with the latest M-48 Personal Mixing management and new GP I/O functions from the built-in 25-pin port on the rear of the console, opening new possibilities in control for worship, theater, broadcast. and live production markets. Roland’s M-48 Personal Mixing System provides 40 channels that are mixed as 16 stereo groups to each musician on stage via a CAT5/6e cable and allow individual control over each musician's mix. The version 1.101 software allows the setup and control of each M-48 on the network directly from the M-5000. Users can set up two monitor mix zones using REAC A and REAC B ports, which allows a separate set of 40 input sources that can be assigned in 16 stereo groups, providing multiple monitoring mix options without taking up any console resources. The Engineer’s Monitor function allows the sound engineer at FOH to mirror a monitor mix to a local M-48 at the console from any M-48 on the network, listen to it, make adjustments, and send it back to the musician on stage. Each M-48 can store up to 16 presets that can be recalled from the M-48, and those settings can be associated with scenes on the console, enabling automated memory preset recall of all personal mixers when a console scene is recalled. These new software features for M-48 personal monitoring ensure seamless integration and configuration from the console and sound engineer to each personal mixer and musician on the network. Additional version 1.101 software features include GP I/O control using peripherals such as footswitches or touch panels from contact closure inputs. On outputs, the M-5000 can send up to 12 GP I/O commands for fader, scene recall, and user button control, which is highly valued in theater, broadcast, and live production applications. The M-5000 has two built-in REAC ports, plus two expansion card slots with seven expansion card options, including Dante, MADI, Waves SoundGrid, or more REAC ports, as well as audio embedded over video protocols. The back panel includes 16x16 analog I/O, 4x4 AES/EBU, a 16x16 USB audio interface, connection for control via an iPad connected or wireless, and control ports including footswitches, GP I/O, RS-232C, and MIDI. All of this capability enables the console to see up to 300 inputs and 296 outputs, all at 96kHz and even more at 48kHz.